A variety of factors play a pivotal role in steering a consumer’s purchasing decisions. As Oculus360 (O360) discussed relative to the women’s wedding and bachelorette party attire markets, even closely linked occasions of use can yield dramatically different results in the choice of brands and products. To drill further into this dynamic, O360 recently analyzed the leading fashion brands at the office, examining how product categories shape consumer choices and steer optimal messaging relative to a specific market. As before, Amazon plays a critical part in determining that optimal messaging and product design -- along with preferred brands -- in both the men’s and women’s office fashion verticals. The global office fashion market had an estimated $30 billion in sales in 2017, with participants ranging from large dominant brands and massive retailers to boutiques and niche brands. It is a complex, ever-shifting product category within the larger fashion market and requires a thorough, granular analysis to reveal the true dynamics propelling the category, its participants, and customer base. Such a large market makes a granular approach extremely tedious and time-consuming if lacking the appropriate technology to streamline the process without sacrificing accuracy and scope of the results. Fortunately, O360’s AI-driven solutions go a step further than that, enhancing accuracy and scope while lending the analysis speed and agility that simply isn’t possible by other means. Product reviews from leading brands and retailers like Amazon, Kohl's, Macy's, Nordstrom, Dickies, The North Face, Gap, Walmart, and more. By sifting through these millions of comments related to the thousands of products and brands within the category, O360 can identify the strengths and weaknesses for each brand, helping inform and guide their future marketing and product design to maximize impact and conversions. 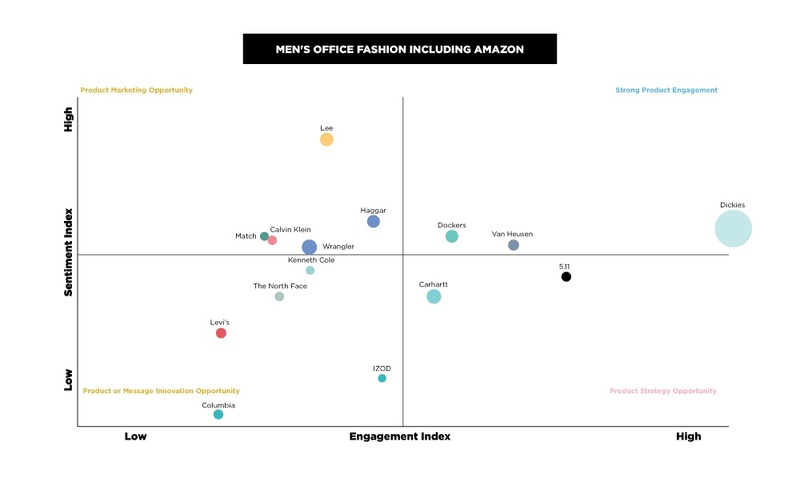 As predicted, Amazon had a demonstrable impact when included in our analysis of the top men’s brands in workplace fashion. In fact, analyzing the category both with and without Amazon reveals the most significant insights into the category itself and the approach to marketing and product design needed to succeed in the competitive industry. While nearly two-thirds of the brands can stand to improve engagement levels with their target audience, another two-thirds enjoy at least adequate sentiment from their customer base. Nordstrom has the highest mix of engagement and sentiment while Dickies does an outstanding job engaging with their consumers in the men’s workplace attire market. However, as demonstrated by the size of the circles representing the data points below, Nordstrom has a low number of online conversations in total while Dickies an exceptionally large number. From a brand perspective, such findings align well with target demographics, with Dickies' audience skewing younger and, therefore, potentially more adept with mobile technology and receptive to participating in online consumer commentary. Regarding what our analysis can provide an individual brand, let’s take a closer look at Haggar. Building upon O360’s in-depth examination in our Haggar Clothing Case Study, the graph below shows the company is best-served devoting increased attention and efforts towards better engaging their audience online. Using O360 to track those engagement efforts over time, Haggar can isolate trends and measure impacts. Analyzing the category with Amazon yields surprising results. Although Dickies stays in the same place, displaying high engagement levels and positive sentiment, companies like Under Armour, Gap, Club Room, and Croft & Barrow disappear for the top 15. Likewise, despite high engagement without Amazon, Nordstrom also vanishes from the top 15 brands in men’s workplace fashion. 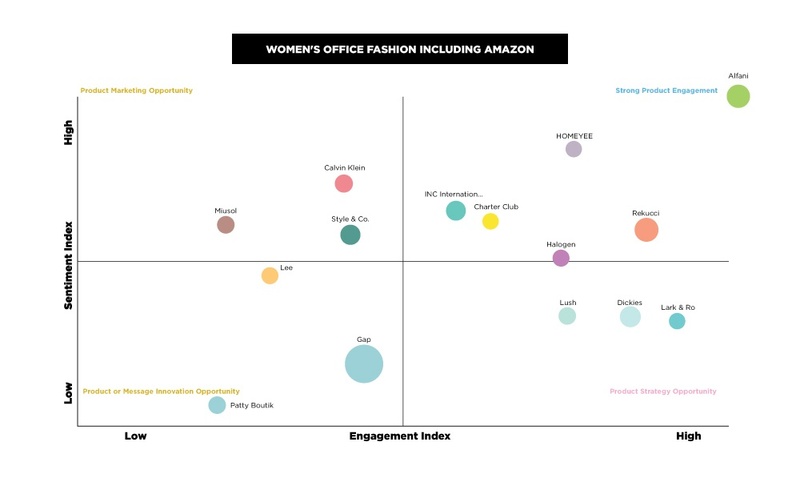 It should come as no surprise that Amazon skews the results of our analysis of women’s office fashion brands as well, but perhaps with a greater degree of consistency between the two graphs. Driven by well over 4.5 million separate conversations gathered from all corners of the digital environment, an examination of the women’s office fashion category reveals a case of one particular brand doing exceedingly well in both sentiment and engagement, and a host of others with specific opportunities to improve their placement within the marketplace. Alfani ranks exceptionally well along the sentiment and engagement indices, far outpacing the competition. However, large brands like Calvin Klein and Style & Co. can take advantage of product marketing opportunities to better engage their target audience. Similarly, both Gap and Ralph Lauren, despite having strong brand names with significant recognition, should pursue product and message innovation to increase sentiment and engagement with their consumer base. 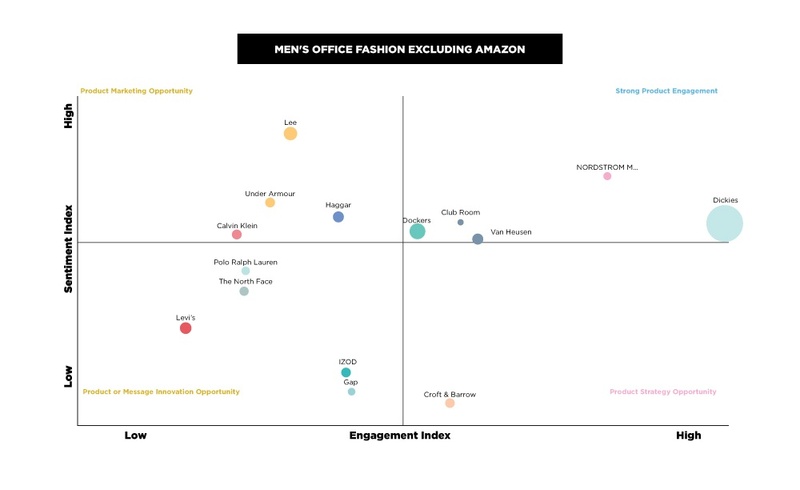 Like the results from our analysis of the men’s workplace fashion category where Dickies ranked high with and without Amazon, Alfani outperformed the competition in sentiment and engagement with the women's workplace fashion audience. However, Calvin Klein and Style & Co., while still showing an opportunity to improve their product marketing, display stronger engagement when O360 includes Amazon in the study. Gap yielded similar results, showing greater engagement but weaker sentiment with Amazon, again revealing the opportunity to improve both the product and messaging to better align with consumers. While this particular analysis centers on the office fashion category, similar opportunities are available in virtually any industry with a digital footprint when using O360’s groundbreaking technology. 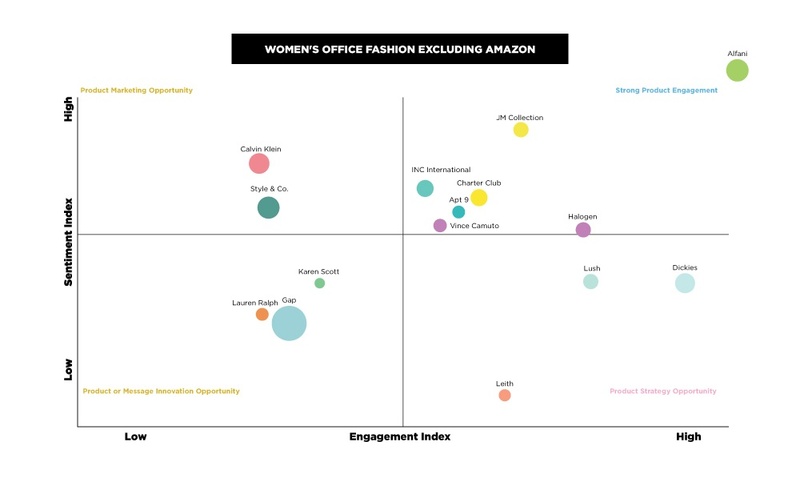 As seen in the office fashion category, brands tend to have similar strengths and weaknesses relative to sentiment and engagement both with and without Amazon. Considering well-established companies like Under Armour, Nordstrom, and others, however, it’s the list of top brands that reveals the most significant differences, with some falling from the list of top 15 brands when including Amazon. Aside from the marketing and product-oriented opportunities revealed in our analysis, O360 is also able to demonstrate how Amazon levels the proverbial playing field for smaller companies. When such companies can properly align their messaging and product design with the specific needs of an audience that knows what they want and are motivated by product recommendations far more than brand recognition, small companies like 5.11 and Match can compete with the likes of Calvin Klein, Van Heusen, and Dickies. With O360 leading the way, companies are given the specific guidance needed to improve their placement within their market category, gain competitive advantage, and leverage the insights that only authentic, relevant consumer commentary affords.